It is quite standard now that when a new edition of the Warhammer 40, 000 rulebook comes out, as it did this summer, that there will be a new boxed set following soon after. And here we have it: Dark Vengeance, out now as a limited edition for £65 (cheaper online if you hunt around…), featuring a model that will not be in later editions of the Dark Vengeance box, so it seems (Chaplain Seraphicus). Dark Vengeance features two complete armies, Dark Angels Space Marines, and a force of Chaos Space Marines and Chaos cultists. This latter faction represents the most notable addition to the W40K rules: that of alliances. There is a handy allies table inside the miniature rulebook (page 113) that comes with the Dark Vengeance box-set. There are varying degrees of alliance: Battle Brothers (ie: close allies, so Space Marines & Imperial Guard), Allies of Convenience (so, Tau and Chaos Space Marines, for example), Desperate Allies (eg: Dark Eldar and Space Orks), and Come The Apocalypse (alliance not happening!). It’s an intriguing set-up and allows for some inventive pairings: Tau and the Black Templars might put aside their differences and team up to take on, say, the Tyranids, or the Necrons. So, most eye-catchingly, the models; there are 48 miniatures in total. 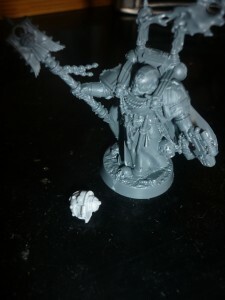 6 x Chosen Chaos Space Marines, 1 x Hellbrute, and 20 x Chaos Cultists. The level of detail throughout is superb, and there are lots of unique models, such as the character figures, that you won’t find anywhere else. The tactical marines and the chaos cultists have repeating models throughout their ranks, but approximately half of the miniatures are individual sculpts. 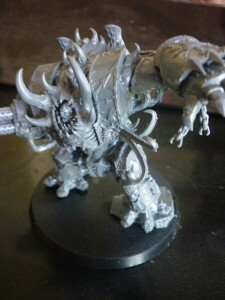 The Hellbrute dominates the set (see right), and there is wonderful contrast between the clean, sharp lines of the Dark Angels, and the baroque, somewhat rag-tag Chaos army. As far as I can gather, the Seraphicus figure is only available for a limited time in the initial batch of DV sets, and future runs of the game box will not feature the chaplain. It is a superbly sculpted figure, with vast amounts of detail, particularly impressive are the character’s torso, his crozius arcanum and his skull-faced helm. 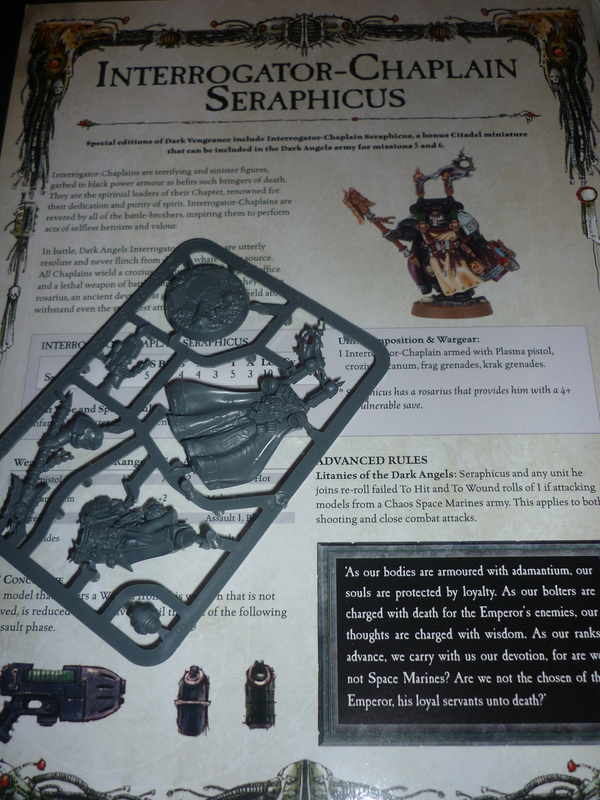 As well as the actual figure, which comes with a great sculpted base, you get a unique character reference sheet for Seraphicus (see above left). It is a canny marketing trick, making a very desirable box set even more so. I certainly fell for it! No regrets here, though. In my opinion, this box set easily trumps the last W40K release, Assault On Black Reach. 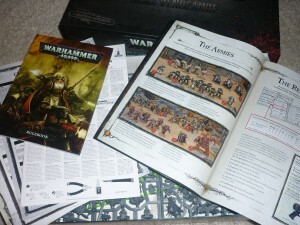 Along with the rule book and the usual templates and blast markers, there is included a fantastic ‘How To Play’ booklet, with background to the storyline, explaining the conflict between the Dark Angels and the Crimson Slaughter Chaos Space Marines (they have a great backstory), the major characters involved, and also featuring a sequence of six missions using the models in the set. I will admit I am a bit of a Warhammer 40k novice, so I am particularly pleased at the way the booklets explain things in a very boiled-down style. Or, idiot-proof is an equally valid description…. 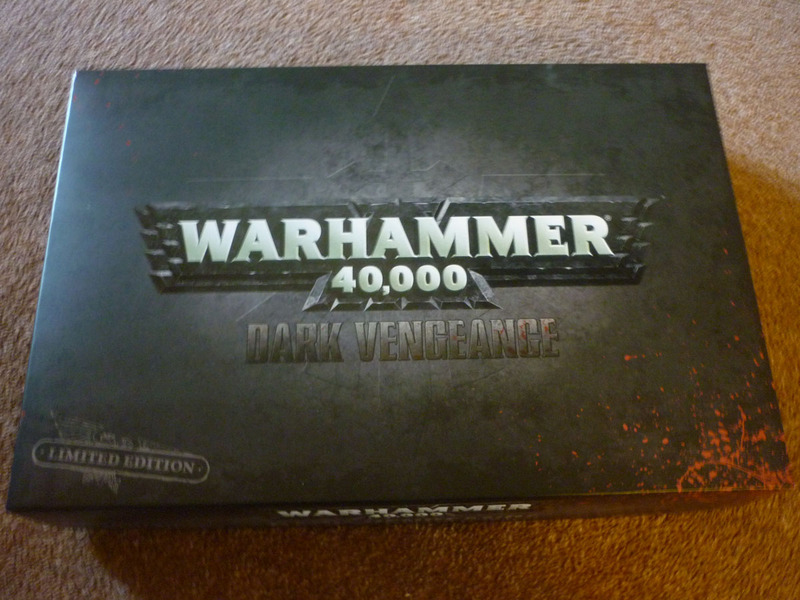 So here is the big question – is Warhammer 40,000: Dark Vengeance worth the outlay of hard-earned? Yes, definitely, and, if I were you, I’d make an effort to get hold of the Limited Edition set. I’d go so far to say that this is the most impressive Games Workshop release since the Space Hulk box set came out in 2009. Dark Vengeance is out now. Let’s put the Dark Angels contingent from the Dark Vengeance 40K starter box into an army list to see how it holds together as a viable ‘beginners’ force. The Lost Guardian: Fumito Ueda and The Last Guardian Whatever happened to the Knights of Badassdom?